Combine your Kilimanjaro climb with a Safari for the ultimate African holiday! Note: The minimum group size for this tour is 2 people and the maximum size is 16 people. We can arrange extra nights at the Springlands Hotel if you are arriving early or staying longer. (915 m/3,000 ft) Arrive at the Kilimanjaro or Dar es Salaam International Airport. You will be met at the airport and transferred to the Springlands Hotel in Moshi for your overnight. Montane Forest Your day starts early with a briefing, followed by breakfast and a 50-minute drive from Moshi to the Machame Village (1,490 m/4,890 ft) where your guides and porters prepare and pack your equipment and supplies. You will receive a lunch pack, and you can also buy mineral water in the village. If the road is very muddy, it may be impossible to drive from the village to the Machame Gate, and in this case, it will take you an hour to complete the muddy 3 km walk to the gate. After registering at the park office, you start your ascent and enter the rain forest immediately. Heavy rains on this side of the mountain often transform the trail into a soggy, slippery experience, so good footgear, trekking poles, and gaiters are useful. 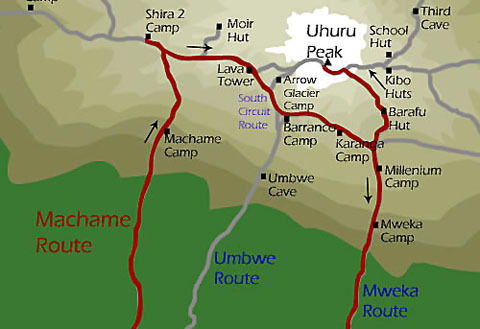 You will enjoy a welcome lunch stop halfway up and will reach the Machame camping area in the late afternoon. Your porters will arrive at camp before you and will erect your tent before you arrive. In the evening, the porters boil drinking and washing water while the cook prepares your dinner. Night temperatures can drop to freezing at the Machame Camp. Moorland You rise early at Machame camp, and after breakfast, climb for an hour to the top of the forest, then for 2 hours through a gentle moorland. After a short lunch and rest, you continue up a rocky ridge onto the Shira Plateau where you will be able to see Kilimanjaro’s great Western Breach with its stunning glaciers. Sometimes, the walls of the Western Breach are draped with extensive ice curtains. You are now west of Kibo on the opposite side of the mountain from the Marangu Route. After a short hike west, you reach the Shira campsite. The porters will boil drinking and washing water before serving dinner. The night at this exposed camp will be colder, with temperatures dropping below freezing. Semi-Desert After breakfast, you will hike east up a steepening path above the highest vegetation toward Kilimanjaro’s looming mass. After several hours, you walk through a rocky landscape to reach the prominent landmark called Lava Tower at 4,630 m/15,190 ft. This chunky remnant of Kilimanjaro’s earlier volcanic activity is several hundred feet high, and the trail passes right below it. For extra credit, the sure-footed can scramble to the top of the tower. After a lunch stop near Lava Tower, descend for 2 hours below the lower cliffs of the Western Breach and Breach Wall to Barranco Camp at 3,950 m/12,960 ft. There are numerous photo opportunities on this hike, especially if the walls are festooned with ice. Barranco Camp is in a valley below the Breach and Great Barranco Walls, which should provide you with a memorable sunset while you wait for your dinner. On this day, be careful to notice any signs of altitude sickness. Alpine Desert After breakfast, we continue up a steep ridge to the great Barranco Wall, then you climb this imposing obstacle, which turns out to be easier than it looks. Topping out just below the Heim Glacier, you can now appreciate just how beautiful Kilimanjaro really is. With Kibo’s glaciers soaring overhead, you descend into the lush Karanga Valley to the Karanga Valley campsite. From the camp, you can look east and see the jagged peaks of Mawenzi jutting into the African sky. After a hot lunch in camp, your afternoon is at leisure for resting or exploring. After two long days, this short day is very important for your acclimatization, since your summit push is about to start. Alpine Desert In the morning, you hike east over intervening ridges and valleys to join the Mweka Route, which will be your descent route. Turn left toward the mountain and hike up the ridge through a sparse landscape for another hour to the Barafu Hut where you will receive a hot lunch. The last water on the route is in the Karanga Valley; there is no water at Barafu Camp, even though Barafu is the Swahili word for “ice.” The famous snows of Kilimanjaro are far above Barafu Camp near the summit of the mountain. Your tent will be pitched on a narrow, stony, wind-swept ridge, so make sure that you familiarize yourself with the terrain before dark to avoid any accidents. Prepare your equipment and warm clothing for your summit climb, and drink a lot of fluids. After an early dinner, go to bed for a few hours of precious sleep. Day 7 – Summit Day! Scree and seasonal snow You will rise around 11:30 PM, and after some steaming tea and biscuits, you shuffle off into the night. Your 6-hour climb northwest up through heavy scree between the Rebmann and Ratzel glaciers to Stella Point on the crater rim is the most challenging part of the route for most climbers. At Stella Point (5,685 m/18,650 ft) you stop for a short rest and a chance to see a supremely sanguine sunrise. At Stella Point you join the top part of the Marangu Route, but do not stop here too long, as it will be extremely difficult to start again due to cold and fatigue. Depending on the season and recent storms, you may encounter snow on your remaining hike along the rim to Uhuru Peak. On the summit, you can enjoy your accomplishment and know that you are creating a day that you will remember for the rest of your life. After your 3-hour descent from the summit back to Barafu Camp, you will have a well-earned but short rest, collect your gear, and hike down a rock and scree path into the moorland and eventually into the forest to Mweka Camp (3,100 m/10,170 ft). This camp is in the upper forest, so you can expect mist or rain in the late afternoon. Dinner, and washing water will be prepared, and the camp office sells drinking water, soft drinks, chocolates, and beer! Forest After a well-deserved breakfast, it is a short, scenic, 3-hour hike back to the park gate. Don’t give your porters any tips until you and all your gear have reached the gate safely, but do remember to tip your staff at the gate. At Mweka Gate, you can sign your name and add details in a register. This is also where successful climbers receive their summit certificates. Climbers who reached Stella Point are issued green certificates and those who reached Uhuru Peak receive gold certificates. From the Mweka Gate, you will continue down to the Mweka Village, possibly a muddy, 3 km, 1 hour hike if the road is too muddy for vehicles. In the Mweka Village you will be served a delicious hot lunch after which you are driven back to the Springlands Hotel in Moshi for an overdue hot shower and comfortable night. to Highview Hotel The drive from the Springlands Hotel to Lake Manyara National Park takes about 4 hours. After having a picnic lunch in Manyara, you start a late afternoon game drive, which is the best time to view animals in this park. When you approach it from the east, the Rift Valley escarpment looms on the horizon forming an impressive backdrop to the lake. In the tall trees of the ground water forest, monkeys leap from branch to branch, and on the escarpment, elephants stand in the shade. Other animals frequently seen are zebras, impalas, monkeys, giraffes, buffalos, hippos, and others. Overnight at the Highview Hotel or the Twiga Camp - full board. to Serengeti Wild Camp The drive to Serengeti National Park via Olduvai Gorge takes 3 to 4 hours. Olduvai Gorge is an archaeological site located in the eastern Serengeti plains, in which early human fossils were first discovered. It has an amazing landscape that resulted from the same tectonic forces that created the Great Rift Valley millions of years ago. Then in the late evening, drive to and overnight at either the Serengeti Wild Camp or Ikoma Gorge Camp - full board. to Serengeti Wild Camp After breakfast, venture into the Serengeti’s wilderness corners for a full day of game viewing in the park. With a picnic lunch beside you, take your leisure while exploring this world heritage site, where earth’s largest concentration of plain game still roams free! In the late evening, go to either the Serengeti Wild Camp or Ikoma Gorge Camp for rest, dinner, and overnight - full board. to Highview Hotel After breakfast, take morning game drives in Serengeti National Park, then later in the afternoon, drive to Ngorongoro Crater. Drive to the Highview Hotel or Simba Camp for overnight - full board. or Kilimanjaro Airport Drive 30 minutes from the Highview Hotel to the gate for Ngorongoro Crater. On the eastern side you will see the Rift Valley, elephant, buffalo, zebra, monkey, birds, as well as viewing the crater rim. Tanzania’s best concentration of wild animals is in Ngorongoro’s huge, perfect crater. This is also the best place in Tanzania to see black rhino as well as prides of lion that include the magnificent black-maned males. There are lots of colorful flamingoes and a variety of water birds. Other game you can see include leopard, cheetah, hyena, other members of the antelope family, and small mammals. Then, in the late afternoon, drive back to the Springlands Hotel in Moshi or the Kilimanjaro Airport to catch your flight home. Site content Copyright © 2007-2019 Gerry Roach. All Rights Reserved.